Look around an you’ll see an ordered world. An ordered Universe. You’ll also see it tends towards disorder. Things fall apart. Stars die. Mind and external energy are required for the upkeep of things. These two observations are (sort of) basically all we need to know God exists. 1. The world is ordered. 2. The world tends towards disorder. 3. If the world tends towards disorder, then organization of the world increases the farther we look back in time. 4. If the world is ordered and organization of the world increases the farther we look back in time and the world had a beginning, then organization of the world was maximal at the beginning of time. 5. If organization of the world was maximal at the beginning of time, then the world was initially ordered by a mind. 6. If the world was initially ordered by a mind, then God exists. 7. The world had a beginning. This is a valid deductive argument. I could show you in sentential logic, if you want. That means, if the premises are true, the conclusion must be true. In fact, if the premises are probably true, the conclusion is also probably true. All I must do is demonstrate that these premises are more likely valid than not. Look around. There is order: complex biological systems, stars, planets, a water cycle, planetary orbits, etc. There could be matter and energy spread evenly throughout the Universe. Instead, it’s put together into useful forms. That means that the order in the world is greater than 0, at the very least, which is all we need for this argument. The world tends towards disorder. Here’s where the second law of thermodynamics comes in. In its most basic form, the second law states that energy tends towards equilibrium. If there’s a hot thing and a cold thing, the energy will dissipate so that it spreads equally between them. Differing levels of energy are required for order, and completely even distribution of energy is disorder, so it follows from the second law that order tends to disorder. Put another way, the second law states that entropy (i.e. non-usefulness of energy or disorder) increases. My definitions are not technical, but they suffice for our purposes. If the world tends towards disorder, then organization of the world increases the farther we look back in time. I don’t expect anyone would deny this. If the world is ordered and organization of the world increases the farther we look back in time and the world had a beginning, then organization of the world was maximal at the beginning of time. If organization of the world was maximal at the beginning of time, then the world was initially ordered by a mind. III. The world was ordered ex nihilo. III is obviously absurd. How about II? I don’t think there could be any physical thing at the very beginning of time that could order things, so II is out. I is the only option left. Some Pre-Socratics had a sinilar idea, of a mind that orders the world. 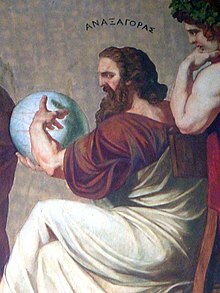 Anaxagoras (c. 510-428 BC) conceived of a mind, nous, which ordered the world and set it in motion. The Stoics and Philo of Alexandria conceived of a similar mind, which they called the logos. In the beginning was the Word [Gr. logos] and the Word was with God and the Word was God. Somehow, the neoplatonists expanded this concept to a tripartite God, incredible in its similarity to the Christian trinity. If the world was initially ordered by a mind, then God exists. Call it nous or logos if you want. The world had a beginning. I might try turning to science here, but instead I’ll go to philosophy. Consider a hotel with infinite rooms and infinite guests. Now imagine all the guests in the even-numbered rooms check out. In math, you can’t do infinity minus infinity. It just doesn’t work. Therefore, this situation is impossible. And why is it impossible? Because an actual infinity is impossible. And if an actual infinity is impossible, the Universe can’t be infinity years old. A lot to unpack here, but I think your argument breaks down at Premise 1. Premise 1 - You presume this to be true, but what do you mean by 'ordered'? What is your definition of 'order'? You list quite a few examples, and then assume that is self-evident. I'd argue that many of these things are simply the conclusion of classical physics such as gravity and could be used to argue a world of disorder. Complex biological systems - Is a single cell organism more or less 'ordered' than a multi-cell organism? When a reproducing cell has a mutation which causes the death of the cell, is that order or disorder? When a virus invades a cell to reproduce, is that order or disorder? Stars - Is material collected together by gravity more 'ordered' than material that is spread out? Planets - Same question above - material gathering around a gravity well. Is that more 'ordered' then a asteroid not caught in an orbit? Water cycle - So, why does the fact that water goes through its phases imply order? On some planets, nitrogen goes through a cycle between liquid and gaseous due the pressure and temperature of that planet. It is an element following physical laws. Is that your definition of 'order'? Planetary orbits - See above. If gravity exists, orbits will exist. This doesn't necessary make orbits 'orderly'. Is an elliptical orbit more 'orderly' than a circular one? Is a comet's orbit more 'orderly' than a planet's? In your next paragraph, you imply that something is 'ordered' if it is 'useful'? What is useful? There are millions of rocks hurtling through the universe. Some of these could hit a planet at speeds to wipe out all life on that planet. Is that 'useful'? There are gamma rays hurtling through the universe that could kill any living cell in an instant. Is that 'useful' and 'ordered'? For your final paragraph, you again assume that there is some quality called 'order' that could be applied to the universe. My argument is you are working backward. There is no inherent 'order' to the universe, but you are applying one. In the same way that there is no apparent 'meaning' in a sunset or a sunrise, and yet we has humans assign the quality of 'beauty' to the rotation of the earth and the decrease in photons. Anyway, some food for thought. Thanks for sharing. Have a great day. I did take that the universe is orderly to be somewhat self-evident, because I think it is in fact self-evident. Instead of being ordered, the contents of the universe could have been random, clumped, or uniform. Since it is none of these, the universe must be ordered. Have a great day, yourself.